(CNSNews.com) - The tax plan the House Ways and Means Committee will release on Wednesday may eliminate the federal income tax deduction that people are currently permitted to take for the state and local income or sales taxes they have paid. That deduction, according to the latest Internal Revenue Service data, was taken by 42,502,130 tax filers—or 95 percent of the 44,671,840 tax filers who itemized their deductions in tax year 2015. The deduction allowed those 42,502,130 tax filers to reduce their federal taxable income for 2015 by a combined $351,163,796,000. The tax reform framework that the White House, the House Ways and Means Committee and the Senate Finance Committee agreed to in September said the tax plan it envisions “eliminates most itemized deductions, but retains tax incentives for home mortgage interest and charitable contributions.” It did not say it would retain the deduction for state and local income and sales taxes. Over the weekend, in response to criticism of the potential elimination of the deduction for state and local income and sales taxes, House Ways and Means Committee Kevin Brady (R.-Texas) announced that his committee would not eliminate the itemized deduction for local property taxes—which is different from the itemized deduction that allows people to subtract the money they pay in state and local income or sales taxes from their federal taxable income. "At the urging of lawmakers, we are restoring an itemized property tax deduction to help taxpayers with local tax burdens,” said Brady. On Monday, as reported by the Washington Post, Brady said the three deductions the committee would keep in its simplified tax code would be for mortgage interest, charitable contributions and property taxes. “Right now on the postcard will be the mortgage deduction, the charitable and the property tax deduction,” Brady said. Data from tax year 2015, which is the latest the IRS has released, shows that the deduction for state and local income and sales taxes is used by 95 percent of taxpayers who itemize their deductions. In a recent summary of existing federal tax deductions, the Congressional Research Service explained how the state and local income and sales tax deduction and the separate property tax deduction work. “Taxpayers who itemize can choose between deducting either state and local income taxes or sales taxes, but not both,” said CRS. The state and local income or sales tax deduction is not just used by wealthy taxpayers. In 2015, there were 7,659,190 tax filers with AGIs between $50,000 and $75,000 who itemized their deductions rather than take the standard deduction. Of these, 7,253,100—or about 95 percent—claimed a deduction for state and local income or sales taxes. That deduction reduced the federal taxable income of those filers in the $50,000-to-$75,000 bracket by a combined $19,144,842,000. There were 6,926,330 tax filers with AGIs between $75,000 and $100,000 who chose to itemize their deductions. Of these, 6,645,180—or about 96 percent—claimed a deduction for state and local income or sales taxes. That deduction reduced the federal taxable income of those filers in the $75,000-to-$100,000 bracket by a combined $25,454,408,000. Also in 2015, there were 13,936,090 tax filers with AGIs between $100,000 and $200,000 who itemized their deductions. Of these, 13,520,160—or about 97 percent—claimed a deduction for state and local income and sales taxes. That deduction reduced the federal taxable income of those filers in the $100,000-to-$200,000 bracket by a combined $87,372,834,000. 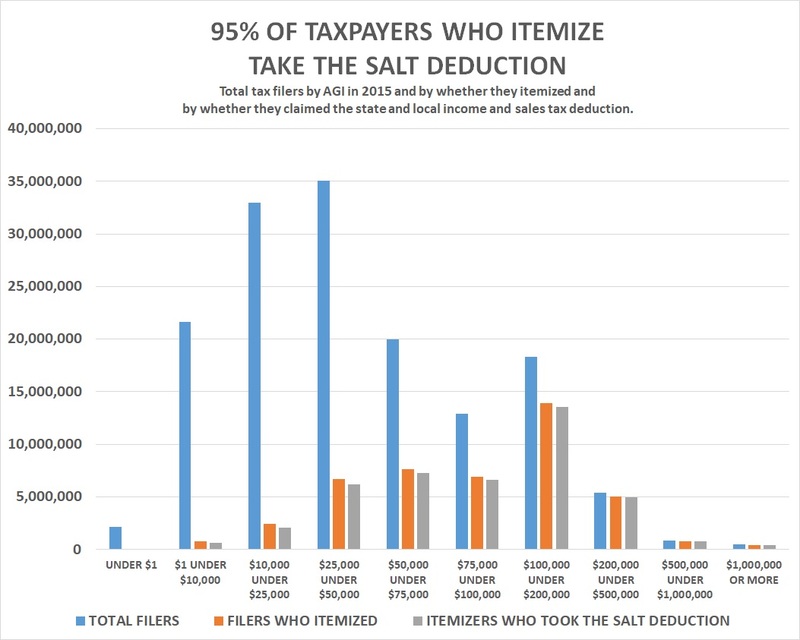 Together, the 22,435,750 tax filers who had adjusted gross incomes ranging from $50,000 to $200,000 in 2015 who claimed a deduction for state and local income or sales taxes equaled 96 percent of all itemizers in that income range. Together, they were able to subtract $131,972,084,000 from their taxable income because of the deduction. At the same time, 398,090 taxpayers with AGIs of $1,000,000 or more in 2015 also claimed a deduction for state and local income or sales taxes. That equaled 99 percent of itemizers in that income tax range. These tax filers were able to subtract a combined $98,152,307,000 from their taxable income. Sen. Rand Paul (R.-Ky.) was the only Senate Republican to vote against the budget resolution. In explaining his vote, he cited the potential impact of eliminating the deduction for state and local income and sales taxes while retaining progressive tax rates. “The problem comes because in their plan they’ve eliminated the deductions many Americans take for their state and local taxes, and they’ve also eliminated the personal exemption,” said Paul in an op-ed published by Breitbart. “This could put many Americans in the $50,000-$200,000 range in a trap where their taxes would go up--some very significantly. “There are solutions, and I’ll offer a few possible ones here,” said Paul. “First, if you really do want to eliminate the state and local deductions and think it is good policy, that’s fine. But then the rate the taxpayer pays must be low enough to compensate for it. That’s always been the idea behind the ‘Flat Tax,’ but it applies here. You have to lower the middle rate from 25 to 20 to come near fixing the problem for everyone. “You can also adjust the brackets, making more middle- and upper-middle class people subject to the 12 percent rate for a larger share of their income,” said Paul. The tax plan framework released by the White House and the Ways and Means Committee calls for three or four tax rates—but does not indicate the income levels to which they would apply.